We’ve all heard the warnings: “Ozone Action Day today!” but what does that mean, exactly? Air quality outside your home can mean you need to take measures to protect your indoor air as well. Ozone Action Days are based on the Environmental Protection Agency’s Air Quality Index (AQI). The AQI is a daily indicator of how polluted the air is in over 300 areas of the country. The value indicated gives an idea of what health effects, if any, you may have after breathing polluted air. The AQI measures the five air pollutants that the Clean Air Act regulates: ground-level ozone, particle pollution also known as particulate matter, carbon monoxide, sulfur dioxide, and nitrogen dioxide. Ground-level ozone and particulate matter are the two that are of most concern for human health. The AQI is reported as a number from 0 to 500, with 0 being clean air and anything over 300 being hazardous and a major health concern for the entire population of the affected area. Has a description of the meaning of the health concern. 0-50: “Good” air, represented by the color green, is safe air. Little or no health risk. 51-100: “Moderate” air, represented by yellow, generally has an acceptable air quality. For a very small number of people, such as those with a strong insensitivity to ozone, there may be a moderate health risk. 101-150: “Unhealthy for Sensitive Groups” such as the elderly, children, and those with respiratory and heart disease. Shown by the color orange. 151-200: At the red level, the air is “Unhealthy” for everyone. Members of sensitive groups may be at serious risk. 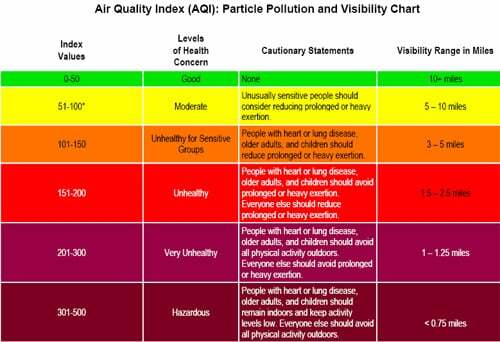 201-300: “Very Unhealthy” air is indicated with purple, and can pose a risk to everyone who is exposed to it. A health alert would be issued. 301-500: “Hazardous” air will trigger emergency conditions and health warnings. Serious risk to the entire population of the affected area. Represented by maroon. If anyone in your family has breathing difficulties such as asthma or emphysema, heart disease, or is either very young or elderly, you want to have air cleaning measures in place on Ozone Action Days so that polluted outdoor air doesn’t compromise indoor air. Install an air purifier, cleaner, and/or UV sterilizer. To determine your specific needs, speak with an air quality expert. Ensure your air filters are changed monthly, and use HEPA-type filters or filters with a high MERV rating. For filter recommendations, speak with a heating and cooling technician or air quality expert. Have your furnace and air conditioner each serviced annually.